Collecting honey from bee colonies is one of the oldest human activities. Rock paintings and other evidences suggest that humans have been gathering honey since the ancient times. Just like in modern practices, ancient humans use smoke to subdue the bees in order to extract the honey from the hive efficiently. Honey was considered as a high-valued product, and high-level people controlled the production of this sweet liquid in some parts of the world. Over the years, beekeeping became an industry. Different methods and equipment evolved as technology played its part in beekeeping. Movable comb hives were invented, hive designs improved, protective clothing were created, bee smokers were refined, and techniques in honey production were developed. Among the many techniques in honey production is filtration. No one can tell on when exactly beekeepers started to use filters to purify the honey. We can assume that the ancient beekeepers used some sort of filtration devices to remove the impurities. It could be a woven bowl of leaves or it could be manually done through the use of small sticks to pick out the dirt. The list of assumption goes on. But as far as honey goes, the less the impurities, the better. Thankfully, we woke up to this modern era with honey products free of dirt, filth, and other impurities. Strainers have come a long way in making honey products clean and clear. Honey strainers are somewhat underrated pieces of equipment in the beekeeping industry. But its importance to the process is equally comparable to all factors and tools needed in successful beekeeping. Honey strainers are truly essential pieces of equipment in beekeeping. Imagine an unfiltered honey – yes, it’s still sweet, but the sight of impurities within this intoxicating delight make it less desirable. Well, enough with the lecture since we can all agree that honey strainers are important. This article lists the best honey strainers for beekeeping that are available on the market. They come in many sizes and designs, but they still keep their original function – to filter and remove the impurities and make the honey clean. Let’s check them out. There’s no equipment better to filter your honey than a double sieve strainer. And, Mr. Garden Novo Double Sieve Stainless Steel Strainer is just the right piece of tool that you’ll need to process clean honey. Since a honey strainer is an essential part of the honey-making process, might as well get a product that comes from a dependable name. It is very convenient to use – simply place it over a bucket, pour honey, and leave it for a few minutes. 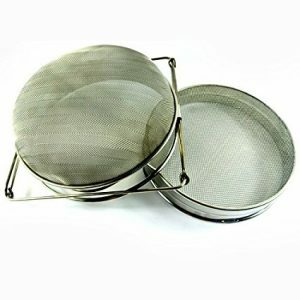 The Mr. Garden Novo Stainless Steel Double Sieve Strainer is made from stainless steel which is durable and is resistant to corrosion and rust. It’s also easy to clean. While filtering honey, the impurities and foreign objects are trapped on the double mesh setup. This allows a smooth process that will produce a consistently clean and light-colored liquid. The packaging of this wonderful product has the dimensions of 10.5 x 10.2 x 4 inches and it only weighs 2.2 pounds. The Cheesea Double Sieve Honey Strainer is a beekeeping equipment that guarantees clean and clear honey product at the end of the filtration process. It is made from food grade stainless steel which is resistant to oxidation and rust. 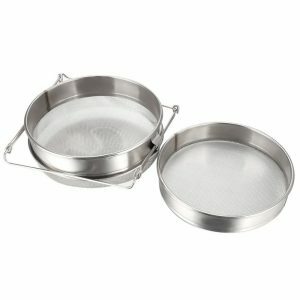 The top strainer measures 9.17 x 9.17 inches while the bottom strainer measures 8.97 x 3.71 inches. This strainer also features extendable arms that can easily fit over different honey buckets. The entire set weighs 1.8 pounds. Many beekeepers have enjoyed the convenience that this strainer brings. It’s so easy to use and easy to clean. After each use, simply put the strainer in a dish washer and you’re ready for the next extraction. Make processing honey more fun with the Cheesea Double Sieve Honey Strainer. If you want to save a lot of time filtering your honey products, go for a honey strainer the can work all the filtration jobs for you. The Navadeal Stainless Steel Double Honey Strainer gives you the ability to work on other activities while waiting for the honey to be completely filtered. No more squeezing of cheese cloths to make sure the honey is clean. Just place this strainer on a bucket and leave it until it’s done. 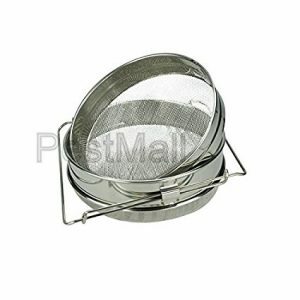 This strainer is made of stainless steel which is durable and can withstand corrosion and rust. It’s also easy to clean, just put it in a dish washer and it’s all good. The arms will snugly fit the bucket giving it stability while filtering. 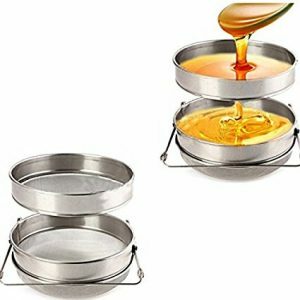 The double sieve setup will ensure that your honey is free from debris and other impurities. The Navadeal Stainless Steel Double Honey Strainer measures 10 inches in diameter and 5 inches in height. It only weighs 1.94 pounds so it’s not a hassle carrying it around. Don’t look around for the bits and pieces when you have everything that you need in one package. 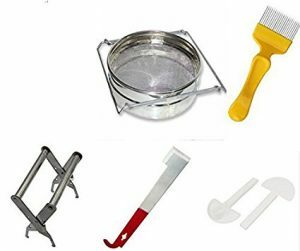 The Lam’s Beekeeping Stainless Steel Double Honey Strainer & Apiary Equipment Hive Set includes the essential things that you need to process your honey efficiently and effectively. This set comes with a double sieve stainless steel strainer with extendable arms to fit over any bucket or container. It measures 9.5 inches in diameter and 4 inches in height. The strainer setup allows smooth filtration that guarantees honey free from impurities and debris. It is made from stainless steel which is resistant to oxidation and rust. It is also very easy to clean. The J hook measures 10 and a half inches long and is also made from stainless steel so, you can expect that it has the same level of durability. The package also includes a bee hive frame grip to ensure stability during extraction, an uncapping fork tool, and five pieces of mini beekeeping entrance feeder. The Goodland Bee Supply double sieve strainer is an equipment that all beekeepers should have. It is also a great tool for people processing honey and syrup in the food industry. It’s a guarantee that you’re getting an excellent beekeeping equipment with one of the most trusted names in the industry. It comes with a 10-inch basket which measures 5 inches in height. This strainer features a 1000-micron top mesh and a 500-micron bottom mesh. This combination allows excellent filtration to ensure your honey is free from impurities and debris. With its extendable arms, this strainer can easily fit over a 5-gallon container or bucket. It can actually extend up to 16 inches making it one of the most versatile strainers on the market. This honey strainer is made from 304 food grade stainless steel which is durable and can withstand oxidation and rust. Goplus introduces its latest double sieve strainer that guarantees excellent honey filtration free from debris and impurities. 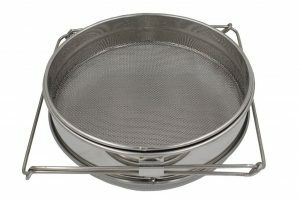 This strainer is made from 304 food grade stainless steel which is resistant to oxidation and rust. Since it’s made from a food grade material, cleaning the strainer is as easy as washing your dishes. The adjustable arms allow the strainer to fit over different bucket sizes and will securely hold it in place. This strainer is guaranteed to last a very long time even after multiple extractions. 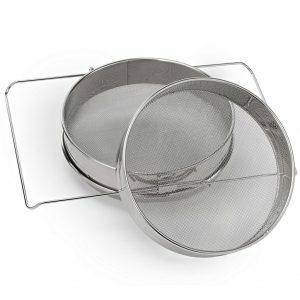 The upper sieve has the dimensions of 9 x 9 x 3.5 inches while the lower sieve has the dimensions of 9.4 x 11 x 3.5 inches. Each hole on the upper sieve measures 1 millimeter and each hole on the lower sieve measures .5 millimeters. These measurements ensure that no foreign material can pass through. The whole set weighs 2.42 pounds. 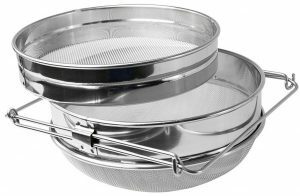 To ensure that you’re processing a smooth, clear, and clean honey product, the Eco-Keeper Double Stainless Steel Honey Sieve is the right equipment to choose. This should be on your list if you’re shopping for a dependable, durable and easy-to-use strainer. This strainer has the measurement of 9 ¼ inches in diameter. The double sieve setup guarantees that debris and impurities are separated from honey during the entire process. 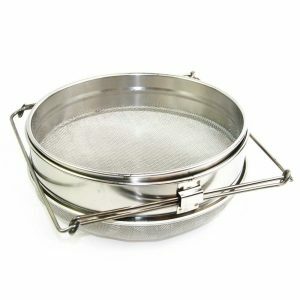 The strainer is made of stainless steel which is resistant to oxidation and rust. It is also very easy to clean and store. It is a durable strainer that will last a long time. This affordable double sieve honey strainer is worth every penny spent. It works very well as proven by many veteran beekeepers. It is so convenient and effective that filtering honey is no longer a big consumer of your precious time. Because of its size, you can process a larger amount of honey and leave it to filter everything while you work on another activity to maximize your day. The DUSICHIN DUS-121 Stainless Steel Honey Strainer is made from 304 food grade stainless steel which is resistant to oxidation and rust, highly-durable, and easy to clean. This unit has the measurements of 9-3/8 inches on the outside diameter, 9-1/8 inches on the inside diameter, and 4 inches in depth. The top screen features a coarse mesh that will easily filter large impurities while the lower screen features a finer mesh to separate even the tiniest particle from the honey. 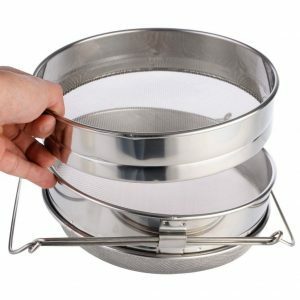 This double sieve strainer from Honey Keeper offers versatility and durability at the cost of a few bucks. This product is made from 304 food grade stainless steel which is resistant to oxidation and rust. It is very durable that can withstand countless numbers of straining. Since the material is food grade, cleaning is as easy as washing the dishes. The top screen comes with a 1000-micron mesh while the bottom screen comes with a very fine 710-mesh. With this combination, you are guaranteed to have a contaminant free honey. The whole set features extendable arms that can be easily used over a 5-gallon bucket. It’s very easy to use and very easy to store. It is one of the most recommended honey strainers on the market. Its packaging has the dimensions of 10 x 10 x 4.5 inches. It weighs 1.7 pounds. This equipment is VIVO’s latest honey strainer that comes with a double sieve to thoroughly filter out impurities from the honey. The double straining process allows a smooth filtration. The VIVO BEE-V101H Honey Strainer is designed with two separated screens for efficient filtration. It is made of 304 stainless steel which is resistant to oxidation and rust, highly-durable, and easy to clean. It features two adjustable arms to exactly fit whatever uncapping tank size. The arms extend to 15.5 inches. The screens are of 1875-micron upper mesh and 650-micron bottom mesh for a smooth and consistent light-colored honey. Aside from these features, the VIVO BEE-V101H Honey Strainer’s main attribute is in the simplicity of its design. The package has a dimension of 10.2 x 10.1 x 4.7 inches. It weighs 2.12 pounds. Beekeepers from everywhere love this honey strainer. They love how this equipment works and how its lasts for a very long time. Here are the best honey strainers on the market. Despite differences in manufacturers, these wonderful products share one common trait that is needed nowadays in beekeeping, convenience. Beekeeping is already tedious, so a little bit of convenience ensures a more enjoyable time with the bees. Additionally, be sure to check out our article on the best honey bottling tanks to store your honey after it has been strained and filtered of any impurities. Do you own any of the honey strainers on this list? Which strainer(s) do you think should be added to this list? Leave a comment below and let us know.